The closeness to Chicago not only makes this area a natural getaway spot but, it also draws many acclaimed artists who now call it home. 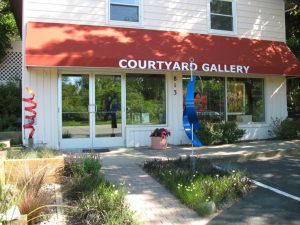 Throughout the year, the art scene in the New Buffalo area vibrates with a vast array of activities including, live theater performances, concerts by the Southwest Michigan Symphony Orchestra, many art festivals and artist showings at the Courtyard Gallery and a whole lot more. If you have a passion for art, as we do, you will see why, we represent many of the finest artists in the U.S. Our quality is outstanding and you will view what over 25 years of searching for the best can produce. Whether your choice is a painting, sculpture, glass, or jewelry, rest assured it is an original, one of a kind. That’s not just words; it is our way of doing business.